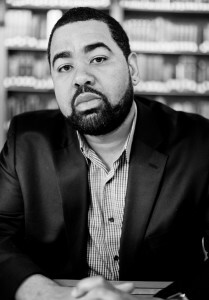 Richard D. Benson II is an assistant professor in the Education Studies Program at Spelman College in Atlanta. A native of Chicago, he earned a dual bachelor’s degree in Sociology and Political Science from Saint Xavier University, an M.A. in Inner City Education Studies from Northeastern Illinois University and a M.Ed. in Instructional Leadership, Educational Studies from the University of Illinois-Chicago. In 2010, he successfully completed the pursuit of his Ph.D. in Educational Policy Studies specializing in the history of education from the University of Illinois at Urbana-Champaign. Dr. Benson’s research interests combine a wealth of experiences and scholarship in critical pedagogy, history of American and African-American education, hip-hop history and youth popular culture, critical race theory and education, history of social movements, and school-community relationships amongst other provocative subject matter. His expertise has led to several published works, including “Sabbath Schools” and “Floyd B. McKissick” both featured in the Encyclopedia of African American Education. As the recipient of many awards including the UNCF/Mellon Faculty Residency Award and the Avery Research Center for African American History & Culture Fellowship, Dr. Benson travels frequently as a guest lecturer throughout the U.S. and abroad, speaking on topics such as education, social consciousness, the Black student movement, and the educational philosophy of Malcolm X. Amongst his most current projects is the book, Fighting for Our Place in the Sun: Malcolm X and the Radicalization of the Black Student Movement 1960-1973 with Peter Lang Publishing. Dr. Benson has appeared as a guest on radio shows including WVON-Chicago’s Education Roundtable and Blackanomics on Sirus XM Radio. At Spelman College, Dr. Benson has taught a myriad of courses such as Educational Psychology, Advocacy in Urban Schools, and the History and Philosophy of African-American Education. As an educator, Dr. Benson is passionate about empowering students to utilize education as a mechanism of personal achievement in society and critical analysis of the world around them. He is involved with several youth/community organizations, including working with the Social Justice Fellows Program of Spelman College and the Raising Expectations youth development program also in Atlanta.